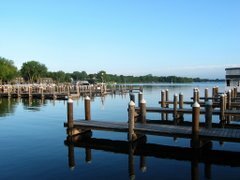 Lake Minnetonka Association: Aquatic Invasive Species - What is the Risk? Aquatic Invasive Species - What is the Risk? Previously, I articulated the Lake Minnetonka Association’s position and vision on aquatic invasive species, or AIS, prevention programs. There I cited six specific elements of a protection plan and ended with a recommendation that the overall protection efforts should reduce the risk of AIS introductions by 90%. Here, I will provide a rationale and objective basis for evaluating the risk as well as the reduction of risk that is needed. While some of this is technical, I can (hopefully) convey the message without it sounding like an insurance seminar. AIS are introduced into lakes by contaminated boats and trailers. Therefore, sources of entry for boats and trailers are the obvious mode of introduction. I have prepared a detailed risk analysis that examines various sources of entry and weighs this against risk of carrying AIS. The detailed analysis document is available on our web site. Here, I will give the highlights and discuss Lake Minnetonka’s vulnerabilities. This clearly points to public accesses as the primary point of a prevention program; although the others should not be ignored. The zero risk from municipal and riparian docks are due to the fact that these boats do not leave the lake. The good news is the protection programs now in place do indeed emphasize public accesses. The bad news is there is not enough coverage. With the above-referenced risk analysis as a basis, it is possible to evaluate the degree of risk reduction now in place. For example, the LMCD’s program of inspectors and automatic video monitors covers four of the most heavily-used public accesses during the summer. Assuming these accesses traffic 50% of the boat use volume and that the period of inspections and monitoring covers two thirds of the boat use season, the overall risk reduction would be 28%, which is short of what we have recommended. Also note that this reduction assumes the inspections or monitoring are 100% effective at stopping AIS, which is probably unrealistic. This makes the case for additional protection. This can happen by increasing the scope of current programs or restricting access points (but not access) to funnel more boats through protected accesses. This risk analysis provides an objective framework to plan an effective AIS protection plan. Clearly, Lake Minnetonka is now highly exposed to an AIS introduction. While additional solutions will be challenging, we should approach the protection of our lake with open eyes to provide the greatest protection.